Caribou The Caribou is a wild species of deer often called reindeer when domesticated. They belong to a large group of hoofed ungulate mammals called artiodactyls which also includes camels and giraffes. They are found in the arctic tundra regions of North America, Asia, Northern Europe, Alaska and Greenland. Caribou can also be seen in sub arctic boreal forests during migration where they take refuge in windy coastal areas from flies and mosquitoes. The caribou is well adapted to its environment. Caribous are large even toed mammals that measure 1.2 – 2.2 metres (4 – 7.25 feet) in length and stand 1.2 – 1.5 metres (4 – 5 foot at shoulder height. They can weigh between 60 – 318 kilograms (130 – 700 pounds). Their coats are short, thick and coloured brown in summer turning grey in the winter. Their rumps and chests are white and they have blunt, hair-covered muzzles and short tails. Caribous have long legs and wide, flat hooves which act like snowshoes helping them walk on snow and soft ground. Caribou hooves are hollow underneath which enables them to dig snow when searching for food. Caribous are the only deer species where both male and female have antlers but some females have no antlers. Males have larger and more branched out antlers than females which can extend in size to over 1 metre (3.25 feet). Their antlers grow directly from their skulls and are covered with a thin skin called a ‘velvet’. 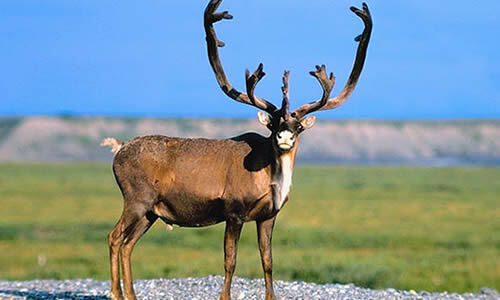 During the ‘rutting’ season, the velvet on the males antlers disappear. Males use their antlers to fight each other for access to females. Male antlers fall off after the mating season has finished and females lose their antlers during the birthing season. When a caribous antler is broken between April and August when in the ‘velvet’ stage, it loses blood flow to the antler and velvet. Caribou have 2 circulation systems in their bodies. The circulation through the legs is up to 50 degrees colder than the circulation system for the rest of their body. Caribous have hollow hairs rooted in a thick layer of fat also to conserve heat during freezing temperatures. Caribou habitats include arctic tundra regions, sub arctic boreal forests and mountainous habitats. Caribous are herbivores and their preferred diet is tundra plant matter including leaves, twigs, moss and lichen known as reindeer moss. When food is abundant, an adult caribou can eat as much as 5 – 6 kilograms of food per day. When the caribou eats, the food goes down to the caribous first stomach, where it is mashed into small pieces called cud and stored to eat at the caribous next meal. Because caribous can eat large quantities of food they increase their internal heat production to prevent them from freezing in extreme weather conditions. Caribou undertake one of the most grueling animal migrations of any other terrestrial mammal. Herds of thousands of animals complete a round migration journey of over 5,000 kilometres (3,100 miles) visiting spring calving areas and summer and winter feeding grounds. During migration, herds of cows (female caribou) leave several weeks before the males, who follow with yearling calves from the previous birthing season. Caribous move from region to region, forced on by seasonal availability of tundra plants on which they feed. Caribou frequently cross rivers and lakes during their migration travels. They are very strong swimmers using their wide hooves as paddles and their thick, air-filled coats help them stay buoyant and warm when swimming through the icy waters. In winter months, caribou move to sub arctic boreal forests where the snow covering is less than on open tundra. Here, they can use their wide hooves to dig and graze on the lichen beneath the snow. Caribou herds can run very fast reaching speeds of 50 miles per hour while migrating. Herds of caribou tend to be larger during spring migration and smaller during autumn when mating occurs. Male caribous fight during rutting season which can result in serious injuries such as cuts and bruises. The worst that can happen is that their antlers can lock together and caribou who cannot unlock their horns will starve. Caribou are generally quiet animals, however, they may emit a loud snort. Herds of snorting caribou may sound like a group of pigs. Groups of cows and new born calves are particularly vocal as they constantly communicate with each other. Caribou predators include wolves, grizzly and black bears, cougars, wolverines, lynx, coyotes and golden eagles. Mating season occurs in autumn as aforementioned. Males fight for access to females. Two males will lock their antlers together and try to push each other away. The most dominant males can collect as many as 15 – 20 females to mate with. 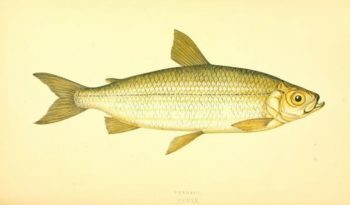 A male will stop eating during this time and lose much of its body reserves. Births take place in May or June the following year on inland calving grounds after a gestation period of 45 days. One calf is born each year with twins being rare. Calves can run shortly after birth, however, large numbers succumb to predators, in particular, Grey Wolves who track down the migrating herds and stalk the birthing grounds looking for easy prey. The young are able to graze and forage but continue suckling until the following autumn and become independent from their mothers. Caribou become sexually mature at between 1.5 and 3.5 years of age. The life span of a caribou is around 15 years in the wild. Despite their large numbers, caribous are an endangered species. The caribou has a very warm very soft fur that is hollow, insulated and sheds water and snow. This valuable fur was traded for a lot of money in the 1800’s. The caribou population decreased because of over hunting until laws were passed to protect it. Caribou are susceptible to and recover slowly from population declines because of their low rate of reproduction. The main factors leading to caribou declines are habitat loss, degradation, and fragmentation, as well as predation. Loss of caribou habitat, which is permanent, occurs when forest is cleared for agriculture. 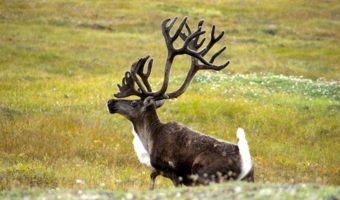 Habitat degradation means a reduction in the amount or quality of caribou habitat, as happens following such events as wildfires or timber harvesting, or through human disturbance.